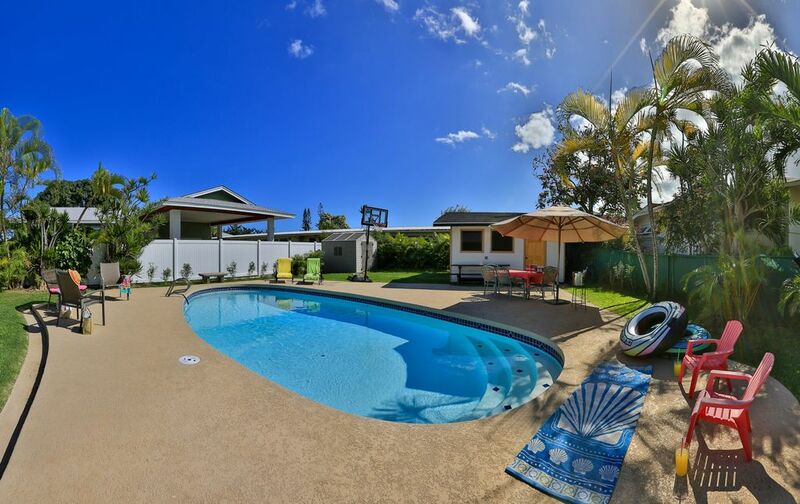 6 Bedroom, 3 Bath Private Home with Swimming Pool & 3 Min Walk To Kailua Beach! After reading all the reviews, I understood that we were going into an older, hot, quaint home. Our family was totally ok with that as were on a very busy event-filled staycation. The pool was the highlight. I think the only thing I could add info on is the little details. Majority of vacation rentals we stay at have the details of "home" like fully stocked showers with shampoo, conditioner, body wash, and kids shampoo. This house did not. Also we had to go buy our own spices and condiments which (in my experience) is not usually needed. No big complaints. If you're looking for QT with your family this is a nice place in a great location for the Kailua experience. In response to this review, we will be adding a few more chairs. Thank you for your valuable input! Our group had a great time. The property was nice. Good house for large groups. The property was very nice, clean, location was great! Nice pool in the back,the house was roomie. We had a great time, but you should know what you are getting. It's an older home that has been renovated to include more bedrooms so the layout is a little funky. There are small steps at the entrance , going down to the kitchen, and in one of the bathrooms, so my elderly parents had to be careful, but it was fine. We happened to go on a very hot and humid weekend and only 3 of the bedrooms were air conditioned so the rest of the house was very very warm and sticky. I think if there are tradewinds it's not too bad, but we just went on a very hot weekend with little breeze. The pool cabana got especially hot, but we put some kids in there and they didn't complain too much. We did have a problem with the refrigerator not getting very cold, so some fish we bought spoiled, but we didn't notice until the last night. We reported it to Misty and she said she'd have it fixed, so hopefully that won't happen to anyone else. Other than that, it's a comfortable home for a big group. We had 8 adults and 4 kids and there were enough beds and space for everyone. The dining room seats 8, so we had to eat in shifts, but that was fine. The living room was large, but not enough furniture for all 12 of us, but people didn't mind sitting on the carpeted floor. The pool was the best part for the kids. It's a decent sized pool and there were a lot of pool toys included. There's also a nice backyard where we could play backyard games. The kitchen is pretty well stocked with utensils and cookware and the BBQ grill worked well. The house is located very close to Kalama Beach (just a short walk) which is a beautiful white sand beach with small waves. The house had some body boards and pop up tents that we used at the beach. Misty was very responsive, met us promptly on our first day, and answered all our questions/concerns promptly. I think if you have a big group and understand that it's not a luxury home and that it may get warm in the house if you go on a hot weekend, you'll enjoy it. If it's hot, just don't plan to stay at home during the day--go to the beach or hang out at the pool!